Caring seems to be at odds with the simple model of economic agents as understood by the wider societal audience. However, care taking is a more and more popular field in economic analysis. A recent study in the Journal of Population Economics, the leading academic outlet in the field of population economics, is now establishing a volunteering premium. This implies that not only people care, it also pays to care. The GLO Fellows have investigated whether volunteering has a causal effect on individual employment opportunities. A field experiment is conducted in which volunteering activities are randomly assigned to fictitious job applications sent to genuine vacancies in Belgium. They find that volunteers are 7.3 percentage points more likely to get a positive reaction to job applications. The volunteering premium is higher for females but invariant with respect to the number of engagements. Klaus F. Zimmermann; Editor-in-Chief, Journal of Population Economics; President, GLO. 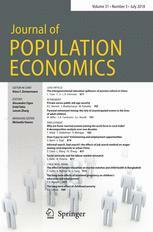 The Global Labor Organization (GLO) supports the Journal of Population Economics.